One in ten young people in the UK, aged between five and 19, is obese, according to new research that looks at obesity trends in over 200 countries. It's not always easy to tell if your child is overweight - especially as even slimmer people are heavier than they would have been 10 years ago. Consultant paediatrician Prof Mary Rudolf, who advises the government on obesity, says many parents would not know that "a healthy 10-year-old's ribs should be clearly visible - many parents would consider that such a child was quite underweight". The "most robust" way is to check their body mass index (BMI) to see if their weight falls within the healthy range for their height - according to the Department of Health. 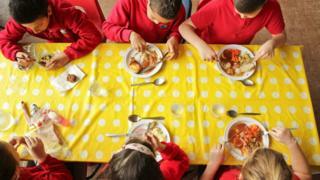 All children in England are measured and weighed for their BMI in reception class (aged four to five) and in year six (aged 10 to 11), under the government's National Child Measurement Programme. Some local authorities send letters informing parents of the result. Generally, the higher the BMI, the greater the risk of medical problems. If your local authority does not do this, you can check your child's BMI using the NHS's BMI calculator - you will need to know their height and weight. Research cited by the NHS in 2009 found that the risk of a girl being obese at the age of eight was significantly raised - a ten-fold increase in fact - if her mother was obese. The risk for a boy was increased six-fold if his father was obese. Its list of 10 tips includes advice such as eating together at the table, banning sweetened drinks, preparing more meals at home or choosing healthier takeaways. Children are recommended to have 60 minutes of exercise a day - but this does not have to be done all at once. It can be done in several short 10 or five-minute bursts of activity throughout the day. Overweight children do not need to do more exercise than slimmer children, as their extra body weight means they will naturally burn more calories for the same activity. Swapping the car for walking or cycling on small journeys is seen as an easy way to get the whole family moving. Children, like adults, should aim to eat five or more portions of fruit and vegetables every day. Experts say unsweetened 100% fruit juice, vegetable juice and smoothies should only count as one portion of a child's five a day, because of the high level of sugar they contain. They recommend a combined total of no more than 150ml a day - which is one small glass. This is because when fruit is blended or juiced it releases natural sugars which increase the risk of tooth decay, so it is also best to drink fruit juice or smoothies at meal times. The NHS says many children are getting half of their sugar intake from sweetened soft drinks and unhealthy snacks. For example, one can of coke can have up to nine cubes of sugar in it. There is little official guidance on precisely how much food children require. But experts advise avoiding adult-sized plates for younger children as it encourages them to eat more than they need. Other tips include starting meals with small servings and letting your child ask for more if they are still hungry. It is also advised that children be encouraged to eat slowly, and not forced to finish everything on their plate. It also helps to have set meal times. Researchers found that those children who had less sleep in their earlier years were at greater risk of having a higher BMI at age seven. This link continued even when other risk factors, such as gender and physical activity, were accounted for in their research. Using fMRI (functional magnetic resonance imaging), poor sleep has been shown to affect the brain areas responsible for complex decision-making, and our response to rewards, causing us to favour unhealthy foods. Although getting the recommended amount of sleep at night is encouraged, sitting and lying around too much in the day makes children more likely to put on weight. Experts advise that children should watch no more than two hours of television each day. And parents are encouraged to remove all screens, including mobile phones, from their bedroom at night. Aisling Pigott, a paediatric dietitian and spokesperson for the British Dietetic Association, says it is important to "talk to children from a young age openly and honestly about food as a positive thing". "Have open discussions about enjoying food, take the focus away from body image to health and wellbeing, as opposed to look and image," she says. "Don't use negative words like 'fat' and 'ugly' with your children - don't talk about cutting down and not eating certain foods as it makes children want them more," she adds. With older children there are many more influences so teenagers should be approached sensitively, Ms Pigott points out. "Don't attack and don't talk about long-term consequences for their health because they don't care, as teenagers live in the here and now," she explains. "Focus on how they look at the moment and help them work on gaining more positive self-esteem." Overweight teenagers will display unhealthy eating behaviours - often restricting their food intake and then overeating. Boosting their self esteem can work well in stabilising their eating habits, according to Ms Pigott. "Reassure them and remind them everyone is a different shape and size - and it's just about keeping within healthy norms."